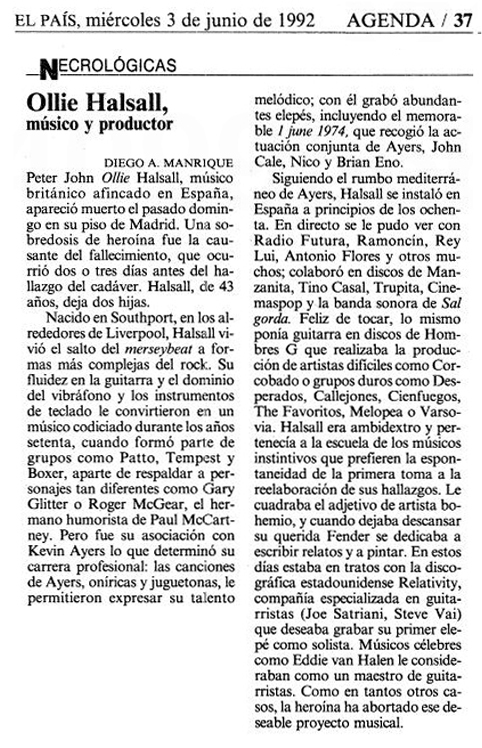 Peter John Ollie Halsall, British musician living in Spain, was found dead Sunday in his apartment in Madrid. A heroin overdose was the cause of death, which occurred two or three days before the discovery of the body. Halsall, 43, had two daughters. He was born in Southport, near Liverpool, and he witnessed the changes from Merseybeat to more complex forms of rock. His fluid guitar playing and his proficiency on vibraphone and keyboard instruments made him a coveted player in the seventies, when he was part of groups like Patto, Tempest and Boxer, apart from supporter for acts as diverse as Gary Glitter or Roger McGear, Paul McCartney's comedian brother. But it was his partnership with Kevin Ayers which determined his career: Ayers' dreamlike and playful songs allowed him to express his melodic talent. He recorded numerous LPs with him, including the memorable June 1, 1974, that registered Ayers, John Cale, Nico and Brian Eno in joint action. Following Ayers to the Mediterranean , Halsall was installed in Spain in the early eighties. He has played live with Radio Futura, Ramoncín, Rey Lui, Antonio Flores, and many others; he collaborated in recordings by Manzanita, Tino Casal, Trupita, Cinemaspop, as well the soundtrack for Sal Gorda. Happy to play, he would either play guitar in Hombres G disks or produce records for artists such as Corcobado or rock acts as Desperados, Callejones, Cienfuegos, The Favoritos, Melopea or Varsovia. Halsall was ambidextrous and was amongst that class of instinctive musicians who prefer the spontaneity of the first take to the reprocessing of their findings. He could be considered a bohemian artist, and when he let his beloved Fender rest, he would write stories and paint. These days he was in talks with the U.S. label Relativity, a company specialising in guitarists (Joe Satriani, Steve Vai) that wished to record his first solo LP. Famous musicians like Eddie Van Halen considered him as a guitar master. As in many other cases, heroin aborted this attractive musical project.